I first became aware of this programme a few years back. The former Mrs. B. spoke Russian like a native and had lived there for a few years, so it was only natural that from time to time she’d want to watch some output – indeed it went as far as having input into the output, but that is another story for another day. When in the studio, they will be asked to appear in some of their favoured day/evening/casual wear and the three “fashion experts” will pass judgment upon the various ensemble. This isn’t done in an intimate, coaching way, oh no. It’s done in a large studio with an audience who will also be sitting in judgment, a few assembled family members and friends and the three appointed “experts”. The events are presided over by Borechka Mikhailovich who takes “camp” to a whole new dimension. 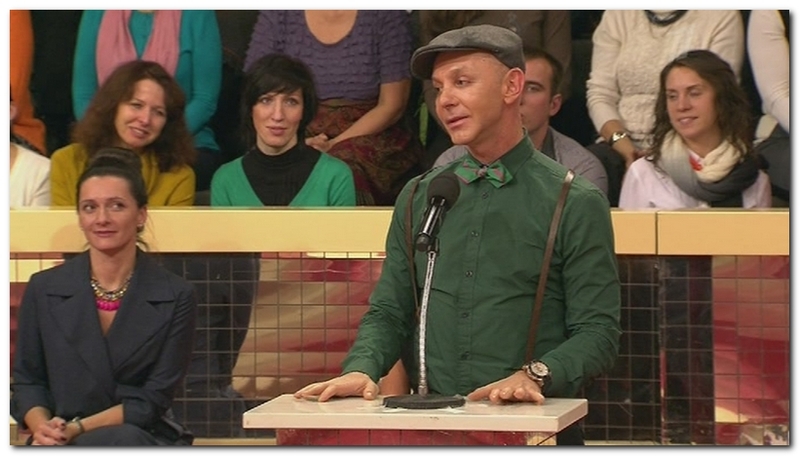 Programme host Borechka Mikhailovich in one of his more Conservative outfits. This is the set and I’ve used a wide shot to put things into perspective. 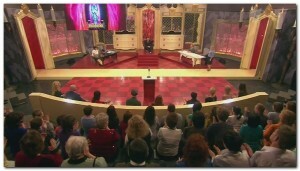 The audience is obvious, the people in front of the low wall are the “friends” and relatives of the Victim and the three experts sit at the tables either side of Borechka who oversees things from his elevated position at centre stage. As we look, the Victim enters from the right, walks all the way across the floor to the full length (and then some) mirror and back until she stops in line with the desk on the right. Borechaka will then say a few words before letting the judges/experts loose with their opinions. This walk is not done in silence; it’s done to the accompaniment of cat-walk style thumpy music and lots of flashing lights. Once our experts have had a go, which you think would be enough humiliation in and of itself, the floor is then thrown open to the friends and family, who are invited to pour their salt on the gaping wound that is the poor Victim’s dignity. She is then given the opportunity to reply – most seem too dumbstruck to manage breathing, never mind putting together a coherent retort. This process does not happen once, but half a dozen times. Once the Victim’s own wardrobe has been ripped to bits (verbally) there is a brief change of atmosphere as partner/children/family gather around the Victim to say a few congratulatory words or perhaps in the case of some partners who have been less than encouraging in their on-screen comments, usually in the form of a thinly disguised plea with his beloved not to divorce/maim/kick him somewhere vulnerable the moment the cameras stop filming! Above: One of the gathering of Family and Friends gives his opinions. He could, perhaps, use a little advice himself… Below: The rest of the gathering look on. We then move onto a section similar to the first, but this time the clothes are chosen by the advisers with comments from the F&F being taken into account, and help is given by stylists, hair and make-up artists backstage. This is where it gets interesting. You might reasonably expect someone to be nervous at the beginning of such a programme but after a while the nerves will settle. Now make them do it all again, but this time in clothes that are not their own, that they would obviously not normally wear and sporting hair/makeup which is not their usual arrangement. Nervous does not cut it – I’ve seen people come out to do their walks in this section looking petrified! A split shot. On the left, the Victim in her own clothes, which I can’t fault at all. 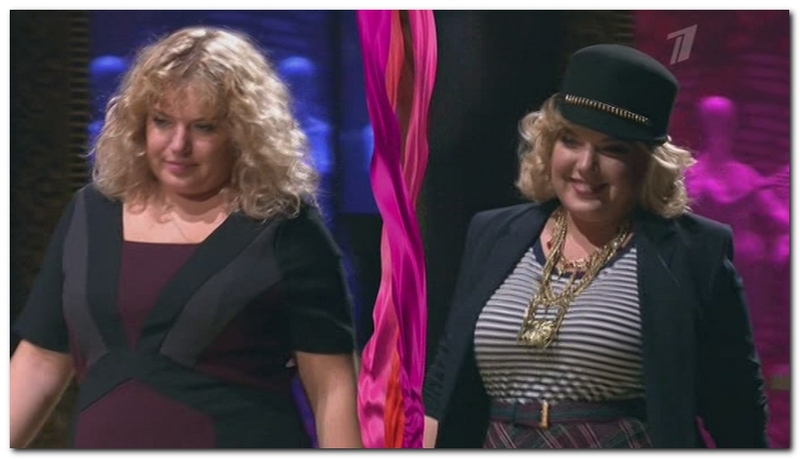 On the right, an outfit based on comments from experts, friends & family. Once a few of the “designed” outfits have been paraded, two rails are brought out onto the set, one with the Victim’s own attire and the other with the get-ups from the second half. The “experts” have a chance to do a brief re-cap and comment, the family & “friends” get the opportunity to put the final nails in the coffin that is the poor Victim’s confidence and then The Studio Audience Get To Vote. Now, this might not be so bad if the margin is not too wide, but in this example (broadcast this morning, so it’s as fresh as I can get it) there is a 100% vote in favour of the clothes that were not supplied by the Victim. So, not only has the poor woman been subjected to ridicule on National TV (and covering 16 timezones, nations don’t come much bigger than Russia; let’s not forget it also goes out across Europe and beyond too) by her family, supposed friends and some of the country’s leading fashion “experts”; she’s also seen the studio audience tell her by a 100% majority vote that the clothes she liked to wear were rubbish! Just what she wanted to hear, I’m sure! Watching this today I really felt for this poor woman. It is my belief that you should wear whatever you are comfortable in unless the situation dictates otherwise (uniform for work etc) and that if someone else does not like what you’ve got on, that is their problem, not yours. Oh, and just for balance, this is the most vocal of the “experts”. I am acutely aware that there is something of a cultural difference in the old Eastern Bloc & USSR where the women seem conditioned to dress as their man dictates (and by acutely aware I mean very recent first-hand experience), no matter how uncomfortable they feel. It’s also odd being a western male put in the position of being asked by a partner what you want them to wear – not just for a specific occasion, but as a style in general. I cannot imagine any of my western female friends even listening to the end of a plea to take part in the programme, never mind doing so!